The inspiration for this recipe came from food blogger Jess Thomson. Stir the chicken pieces together with the fish sauce and rice wine. Marinate in the refrigerator for up to 20 minutes if you have the time; otherwise, proceed immediately. Heat 2 tablespoons of the peanut oil in a large nonstick skillet or wok over medium-high heat until the oil begins to smoke. Add the chicken in a single layer and cook, without stirring, until browned, about 2 minutes. Stir and continue cooking until no longer pink, about 1 minute longer. Transfer the chicken to a plate and set aside. Add the remaining 1 tablespoon oil to the skillet and heat until shimmering. Add the kabocha squash and cook, stirring frequently, until browned and tender, about 5 minutes. If the squash is still too crunchy for your taste, add 2 tablespoons water, cover, and steam 1 to 2 minutes. Add the ginger and cook until fragrant, about 30 seconds. Add the fish sauce, return the chicken to the pan, and simmer until the sauce is fragrant and slightly reduced, about 1 minute. 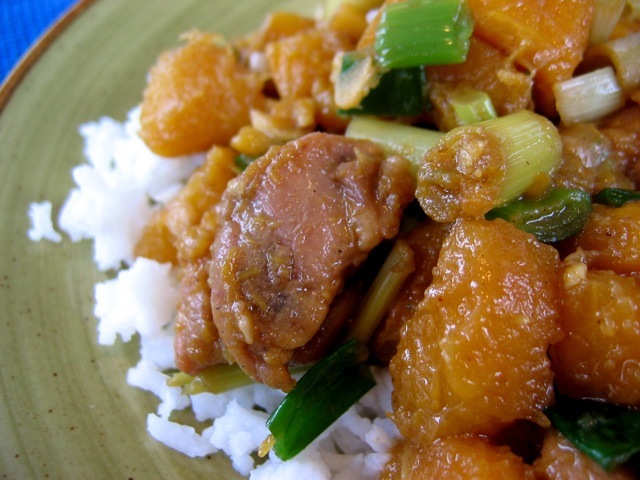 Stir in the scallions and serve immediately with steamed rice.